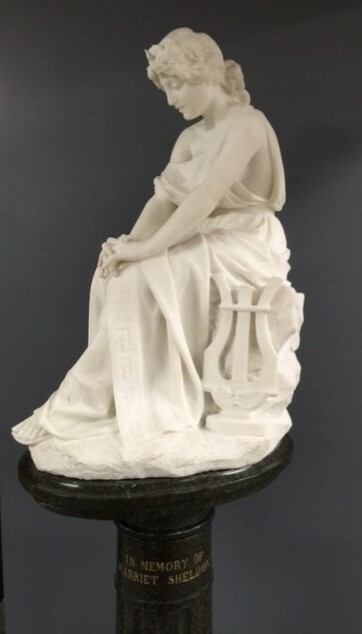 Harriet is the name library staff gave to an Italian white marble statue donated to the library in the 1900s. It was given by Mr. & Mrs. Charles E. Sheldon in honor of their daughter Harriet, who died of typhoid fever in 1901 at the age of 20. The statue was sculpted by P. Milanesy and purchased from the gallery of Pietro Bazzanti in Florence. Thanks to a grant from the Minnesota Arts and Cultural Heritage Fund, we had the statue cleaned and restored in 2015.